What time is the Parade and when can I see the fireworks? 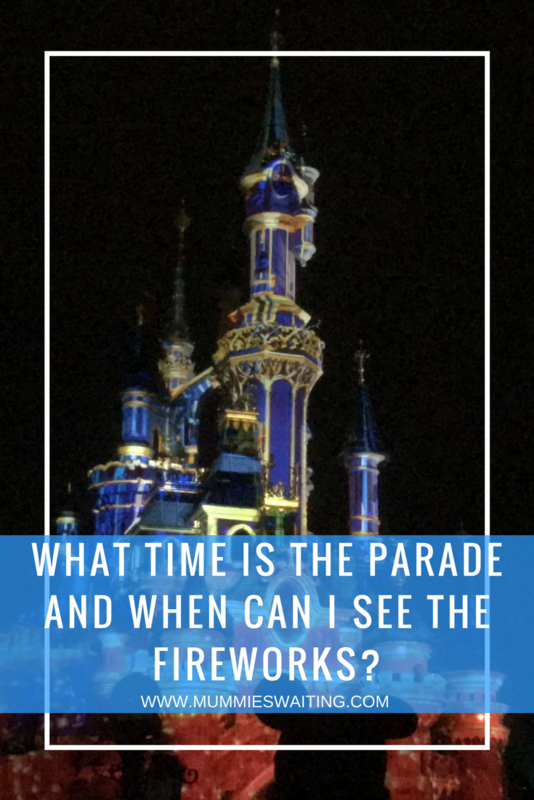 With the parade at Disneyland Paris not having a set time and the fireworks being at a different time every night, a lot of visitors are left wondering how they can plan their trip. If you are anything like me, you want to make sure you eat at the right time so you don’t miss the night time show. So how do you know what time the Parade is and when you can see the fireworks? The current parade is Stars on Parade (not to be confused with Magic on Parade) its the 25th Anniversary parade which has Mickey and all his friends featured on steam punk style and special effect floats. The parade times can change and are only usually released the weekend before, so they best way to make sure you don’t miss it, is to book your dinner at different times. The time depends on the season, but its usually best to aim for 5:00 / 5:30. Take into account time to get a space and that the parade lasts 30-45 minutes (and can be longer if yo u are at the end!) You’ll also need to think about where you will be eating, so you can work out how long it will take to get there. You could queue at the start of the 5’o clock parade and make an Auberge de Cendrillion reservation by 5:35, however queue at the end and you may not get there until 6:15! The fireworks, also known as Illuminations (previously Dreams) the evening light show on the castle, starts at park closing every night if you head over to the Disneyland Paris website you can usually take a look at the closing times a couple of months before you do. Remember the fireworks start at closing time and go on for around half an hour and then you will almost certainly be stuck in crowds of people trying to get out. For 7’o clock fireworks, don’t expect to leave walk out of the park gates until around 7:50! Which of course means a 10pm closing will get you back to your hotel VERY late! If you are staying at Disneyland Paris Monday – Friday, then the best way to see both the parade and fireworks is to alternate days. Monday 4pm, Tuesday 7pm, Wednesday 4:30pm, Thursday 6:30pm. This will make sure that you have 2 days to watch each (if you wish). Just remember you will need to think about any other shows on including those in Walt Disney Studios. If you are looking for something Disney to buy to sprinkle some magic then you can grab this castle with out affiliate link or head over to the Products we love and if you are looking for the perfect Disneyland Paris deal, check out the one below!